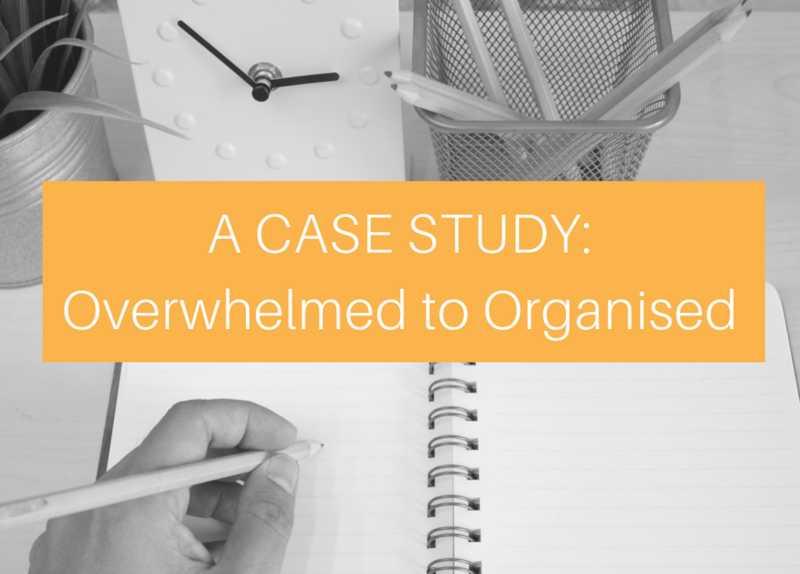 Today I want to share Kelly’s story of how she went from overwhelmed to organised and feeling more relaxed and productive. She actually referred to it as the vortex of overwhelm – sounds serious doesn’t it! I’m so proud of Kelly for making such a big effort to sort our her mess. It was really getting in the way of her already busy life – and she didn’t need the mess making things harder than they already were. Kelly has young children, lives out of town, and spends a lot of her time in the car dropping her family off to different locations, as well as having a doula business that means that she has to drop everything when a client’s baby is due, so that she can support her clients through the birth. With so much flexibility required as a mum and doula, Kelly felt so overwhelmed. She had a huge list of things to do that were all important, and didn’t know where to start – and felt like that every day. She was drowning in files, emails, and files to sort out – all in different devices as well! She couldn’t find what she needed – often – even to the point where she re-wrote a whole document that she had already created – because she couldn’t find it. Kelly initially went through my Detox your Inbox five day challenge, and nailed it – deleting a whopping 17000 emails from her Inbox! She knew that something had to change to make life more manageable, that better systems were the answer and that she needed support to make the changes. She HAD systems – but they weren’t working for her. In her words, they were ‘haphazard’ – a mismatch of different systems. She enrolled in Round 1 of Step up with Systems, and has now totally changed the way she works. Yes – she fell behind, she couldn’t make all of the live calls, she needed support during the program, but she worked her way through it. She created a structure for her week that meant she could pick it up and know what the priorities were if she had a birth to attend or sick children. This helped her reduce the overwhelm of having #allthethings to do #allthetime. A weekly framework meant she could build flexibility in using theme days – a really simple strategy for busy people juggling lots of balls in the air! She persisted with reducing the information overload and worked hard at getting her information organised, and upgraded her storage so that her photos were safe. It took some juggling and moving but making sure that her family photos were safe was really important – but they were also taking up heaps of space on her devices. Kelly had a pretty good system for managing her clients, but with the implementation of a few automations, and mapping out the client journey, she set it up and overnight had 3 replies and $350 in bookings – all automated! Thanks for getting me out of this funk – now I feel in charge and organised. I have felt more relaxed in my day to day operations, knowing that I have systems in place. I spend less time working, and when I do work I’m more productive. Aerlie Wildy is a business designer. business coach and mother based in the Adelaide Hills. I specialise in designing and systemising business for growth. You can connect with me on Facebook, join my Chief Executive Entrepreneurs Facebook Group, check out my Youtube Channelor Pin with me on Pinterest. If you want some support to help fast track this process, or help you transition to Dubsado, then can book a free systems audit with me so we can determine where to start, and what you need to get up and running with your workflows and systems. Aerlie Wildy is a business designer. business coach and mother based in the Adelaide Hills. I specialise in designing and systemising business for growth. You can connect with me on Facebook, join my Chief Executive Entrepreneurs Facebook Group, check out my Youtube Channel or Pin with me on Pinterest. Want a free Systems Audit? Book your Systems Audit here, and complete the questionnaire about your systems. I’ll chat with you about your next steps to build a strong foundation for your business.